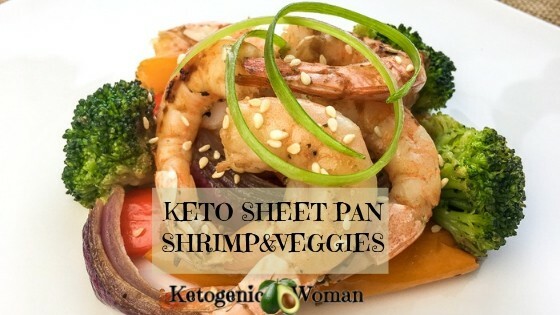 I am a huge fan of any meal that can be cooked in one pan like this fast and easy Keto Shrimp and Vegetable sheet pan meal! This is even faster than ordering a pizza and so much healthier for you and your family, don’t you think? Whether it’s a crock pot, instant pot, sheet pan or roaster, if you can do a family meal and wash one pan, it’s a winner! Please note: The blue links are affiliate links meaning I will earn a small commission if you buy the item. This won’t affect the price you pay and it does help me keep this blog alive. I appreciate how much my readers support me in this way! Rice wine vinegar generally has a fair bit of sugar, so if you are Keto then use what I use, this Nakano unsweetened rice vinegar. If you don’t already have a sheet pan, you need to get a set! These are awesome and have earned Amazon Choice status. You are going to love making future sheet pan recipes with these! I always line my pans with either parchment or a silicon silpat mat. This will make cleanup faster as well as extend the life of your pans. 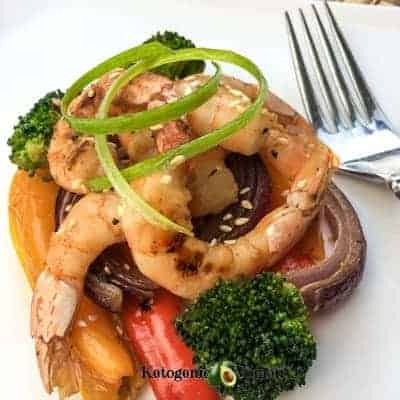 Fast keto sheet pan shrimp and vegetable dinner featuring succulent shrimp and colorful vegetables with Asian inspired flavors. Easy cleanup with just one pan! Serve with cauliflower rice. Line a large, rimmed baking sheet with parchment paper or a Silpat® baking mat. Set aside. Whisk together the soy sauce (or coconut aminos), rice vinegar, sesame oil, honey (or sweetener), garlic powder, ginger, and crushed red pepper flakes in a medium bowl. Season with salt and black pepper, to taste, and stir to combine. Combine the veggies in a large bowl and pour 2/3 of the sauce on top. Toss the veggies to coat with sauce and then spread into a single layer on the baking sheet. Place sheet in hot oven and roast for about 20 minutes. Remove from oven and set aside. While the veggies are roasting, toss the shrimp with remaining sauce in the same mixing bowl. Season with additional salt and black pepper, if desired, and set aside. When the baking sheet has cooled slightly, pour shrimp onto the sheet and spread into a single layer among the veggies. Return baking sheet to oven and roast for another 5-6 minutes, or until the shrimp is opaque. You want to be careful not to overcook the shrimp. Remove from oven and allow to cool for a minute or two. Top with a squeeze of fresh lime, a sprinkle of sesame seeds, and sliced green onions. 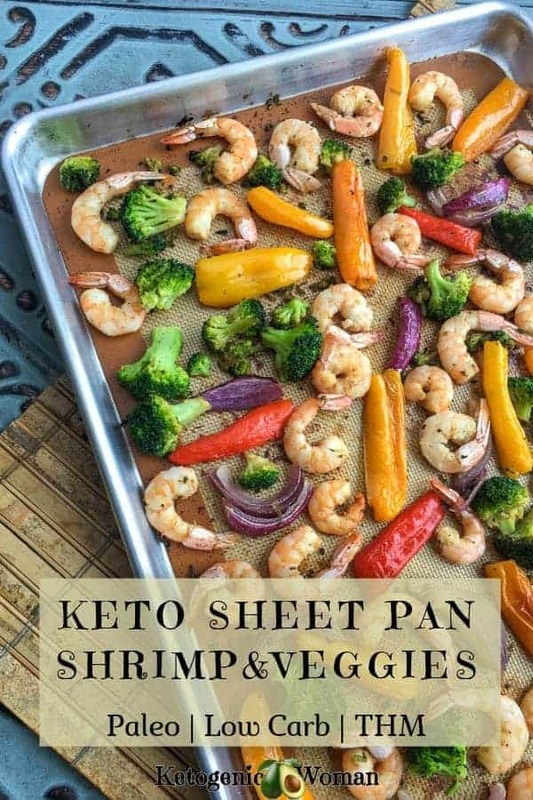 Save this Keto Sheet Pan Shrimp and Veggies Recipe to Pinterest! Tagged One Pan Keto Recipe, shrimp. Bookmark the permalink.